Eric Garrison, author of the Amazon Bestselling novel Reality Check, has invited me to participate in a Tasty Summer Reads Blog Hop. I love food, and while food does not play a big part in my book, it does in the life of my bounty hunter, Victor McCain. When you’re six feet six inches tall and weigh in at two-hundred and eighty pounds, you do love your food. Welcome to the Tasty Summer Reads Blog Hop! Each participant invites a number of others to answer five questions about a recent or forthcoming release, and a recipe that fits with it. Links to the participants I have invited may be found in a while, just above the extract and recipe. Their contributions should be in place soon after this, so check out their blogs over the next few days. Considering I love to snack, as a general rule, I don’t do much snacking when I write. When I’m in a fast paced writing groove, I don’t like to take my fingers from they keyboard, even for food. When I get the munchies, I generally step away from the keyboard, eat a bit, and then get back to it. As far as sweet or salty, I prefer both, often at the same time. I am a definite panster. I have a decent outline in my head of where I am and where I’m going, but I try to keep it spontaneous. I find outlines to be a bit too rigid. And almost never pants. When I write I want to be comfortable, so it’s shorts or sweats. When I wing things, they turn out bad. Very bad. When I was fifteen years old, I offered to cook dinner for the family and I winged the entire thing. How did it turn out? My mother, brother and I ended up eating out. My father, had three helpings of everything. That might explain things, today. I put the leftovers down for the dog, who walked over, took a sniff and then turned and left the room. Get the picture? I follow directions to the T and then pray. A lot. I am currently working on the sequel to The Hand of God, entitled The Watchers. The hero of THOG, bounty hunter Victor McCain, is in for another action packed adventure, as he tries to tie up the loose ends from THOG and deal with a whole new threat, which could end life on Earth as we know it. Piece of cake, right Vic? The Hand of God does have a moment of two of passion, so I would give it a five. Not nearly as graphic as 50 Shades of Gray, but no where near Dr. Seuss, either. Evidently I pissed Blondie off, because he picked up the motorcycle and threw it at my head. At. My. Head. I’ve spent a lot of time hanging with and tracking down members of the Hells Angels and happen to know A Fat Boy weighs north of six-hundred pounds. Blondie couldn’t have weighed more than a buck fifty, yet the bike flew by me like a Randy Johnson fastball. I ducked just in time and Miranda jumped off the dumpster, as the bike hit the top of it, leaving a huge dent in the dumpster and the bike. No doubt the bartender was having a really bad day. Guess so as, growling like some rabid dog, he charged me. This through me for a loop as most men run away from me, not towards me. Then again, I’ve never had anyone throw a bike at me, either. As he was crashing into me, I hit him hard with a two handed blow to the back of of his head, trying to end things right then and there. No dice as, lifting me off my feet and slamming me into a dumpster, he knocked the wind out of my sails. Jesus Christ, the shot I gave him would have crippled most men. Yet all he did was start laughing. It was all I could do not to start gagging from the stench of his breath as it smelled like he had been eating roadkill for dinner. I said, “First off, talking about yourself in the third person points to some severe psychological issues. Second, man, you could use some Tic-Tacs.” Leaning back, then driving forward, I struck him in the nose with a fierce headbutt. My mother always claimed my head is as thick because she dropped me more than once right on my noggin. I could hear his nose crunch and break, a smushed lump in the middle of his acne craters. He started giggling and tried headbutting me back, but I shifted my head at the last moment and he struck the side of the dumpster, leaving a another huge dent. Victor McCain loves his Irish food, with Molly Malone’s Irish Pub being his favorite haunt. 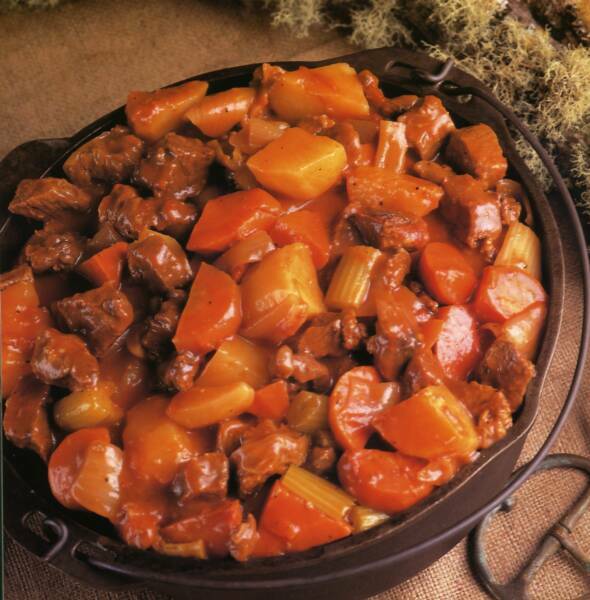 So for your eating pleasure, I offer you Oven Beef Stew. Cut up meat, carrots, and onions. Cut into bite size or medium size pieces. Then add tomato juice, water, basil, salt, pepper and sugar. Place ingredients into a large oven proof (roaster) pan. Cover. Bake one hour. THen add cut up, peeled potatoes. Bake 3-4 hours until tender. Then thicken the liquid with cornstarch or flour, if necessary. This is a great winter meal that smells great when it’s cooking all day. Serves 4-6 people. I normally double this recipe. I am guessing now that I’ve experienced chest pains, my opportunity to try such dishes will be reduced. But not eliminated! I will have to try the combination. And like Vic, I do love me some beef stew. Thanks for tagging me, Tony! I’ve been looking for an excuse to share a recipe or two. I think I might have to have a go at that rather tasty stew as well . . . it’ll be on the list for breaking in the new stove!